For anyone that is alive in Melbourne today, Flinders Street Station history is engrained within their perception of this beautiful city. Built in 1854, this train station has cemented itself as one of the city’s most identifiable landmarks, with tourists coming in droves to witness its impressive architecture. With that said, while you’re unlikely to find a single person in Victoria that is unaware of it, Flinders Street Station history is far more vast and colourful than many may expect. At RNR Melbourne, we provide a plethora of luxurious serviced apartments in Melbourne. This makes us the perfect place to rest and relax while still staying close to the fun and festivities Melbourne has to offer. 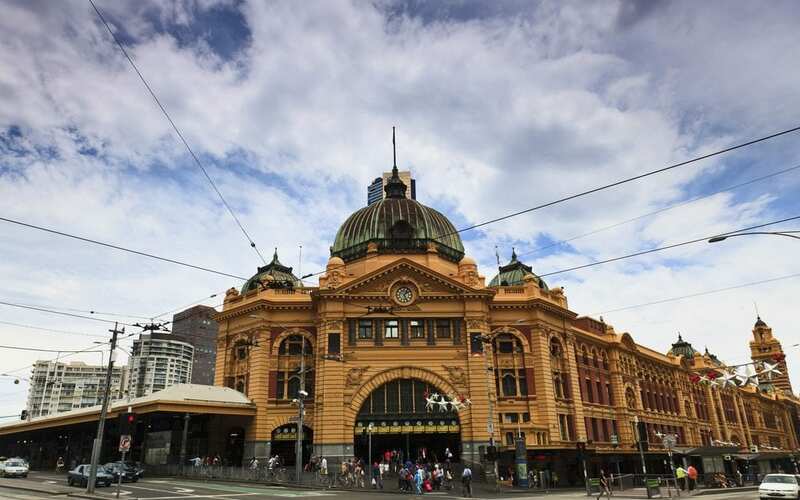 So, if you’re looking to do some sightseeing, or just want to learn a little more about the city’s most iconic transit destination, let’s take a little look at Flinders Street Station history! While this may come as a surprise to some, as of September 12th 1954, Flinders Street Station made history by being Australia’s very first train station. Whilst it still hadn’t received its defining moniker, being named Melbourne Terminus at the time, its standing as the starting point for Melbourne’s thriving transit network quickly cemented its place in Australia’s history. Anyone who has spent time looking at the design and architecture of Flinders Street Station will quickly notice that it holds a lot more room within its walls than is used for daily commuting. This is because in the past, there was much more to the station than trains. Above the terminus sits a sizeable ballroom with a seated capacity of 400 people. Once a meeting place for competitions, dance classes, an array of concerts, and many more events, the doors to this space have unfortunately been closed to the public since 1983. Although whispers come and go regarding the reopening of this hidden space, for now it seems that there are no plans to bring this piece of Flinders Street Station history back to its former use. Staying on the topic of Flinders Street Station’s design, did you know that it is home to the longest train platform in Australia? Platform 1, stretching out at 708 meters, is the longest single train platform in the country, and fourth longest globally. This makes sense when coupled with the fact that, in 1926, Flinders Street Station was the busiest station in the world. Keep in mind that, at this time, other iconic passenger stations were already in use, including New York’s Grand Central Station. Additionally, did you know that Flinders Street Station’s steps were fitted with electrical circuits in the 1980s? While this may seem strange, it’s actually a quite pragmatic choice. These electrical circuits serve two purposes. Firstly, they act as a dryer to avoid the bustling steps to get overly slippery during wet weather. Secondly, as the steps are seen as a busy meeting spot, they provide a little extra warmth to those that are sitting on them. There will always be more to say when it comes to Flinders Street Station history, from its nursery to its gymnasium. While we simply cannot get to all of them in one article, hopefully, we have piqued your interest enough to continue seeking out more odd tidbits about this transit titan. For those that are looking to explore Melbourne’s history first-hand, contact RNR Melbourne today! With a stylish selection of luxurious, centrally-located serviced apartments, RNR is the perfect place to relax without missing out on the action.